When designed correctly, built-in elements have a way of completely transforming the blandest and most awkward of rooms, turning previously underutilized spaces into cabinetry, hidden closets, fold-out tables, and other pieces that add functionality while maintaining a small overall footprint. When a scheme of built-in elements is cohesive, carrying the same visual characteristics across multiple rooms, it can unify the entire home and infuse it with a distinct personality. When it’s unusually clever, it can make a previously unremarkable apartment feel like one big work of art. Italian design firm Studio Gosplan shows off one such transformation with “Into the Woods,” a residence in the local countryside near Genoa. 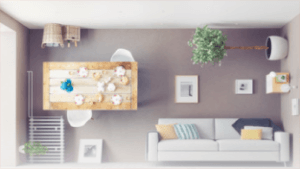 The subdivision of indoor space into impractically tiny rooms, by which some areas of a home are made to feel dark and isolated, is a common problem in the world of interior design. When builders are trying to maximize space on a tight budget, the airiness and daylight transmission of the resulting rooms aren’t typically top priorities. Before Gosplan renovated “Into the Woods,” the house was characterized by a single long hallway that split the interiors into two sections. The designers demolished half of this corridor right off the bat and relocated the staircase leading to the attic in an effort to do away with the home’s “one-directional” feel. Taking inspiration from the early 20th-century modern artworks in El Lissitzky’s “Proun” collection, which itself is characterized by geometric elements offset from one another on irregular axes, Gosplan designed a cross-shaped cieling-mounted structure that would stretch out across the living room, into the adjacent kitchen, and finally through the hallway leading up to the master bedroom. It’s all one continuous element of pale blonde wood, and it contrasts beautifully with the home’s white walls. For most of its length, this new wooden element looks a bit like decorative ductwork, clinging tightly to the ceiling. But in the living room, it descends in one corner to create a suspended staircase, which hangs in the air while a second wooden element continues the path down to the ground floor. The result is quirky and playful, with a cutout window that allows the inhabitants to peer into the room while traveling up and down the stairs. The complementary structure on the ground does quadruple duty as shelving, a long bench, a television stand, and a storage space for firewood. In the kitchen and hallway, the arms of this cross connect to blue volumes that stretch down along vertical planes in the form of cabinets and closets. The doors to the bathrooms and bedrooms are also set within these storage volumes. At the end of the corridor is the entrance to the master bedroom, which itself has been covered in a mirror to visually double the size of the space. Inside, the cabinetry continues in a more muted shade of gray, matching the custom headboard of the bed. A vanity with a fold-down table nestles in between closets. The overall result is a home that feels polished despite its modest dimensions, its aesthetic sensibilities having been simplified simplified by a controlled color scheme and material palette (which consists largely of medium-density fiberboard and natural European oak).